Nouveau Plan de Paris et de Son Enceinte. A stunningly and mammothine folding map of Paris, France, dating to 1867. As the title suggests, this is a 'New Map of Paris,' drawn to illustrate Napoleon III and Georges-Eugène Haussmann's revolutionary modernization of Paris. 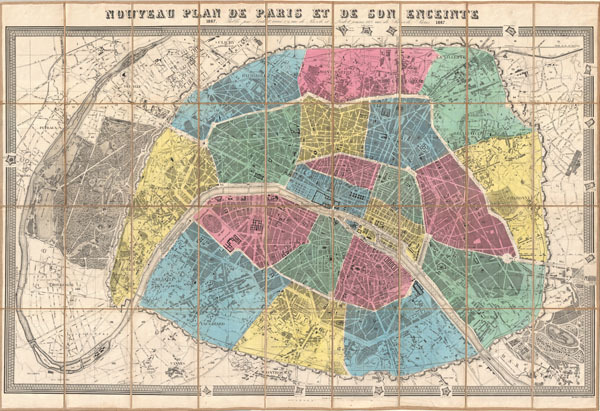 Shows the 1860 repartitioning of the arrondissement system into 20 distinct zones as well as Haussmann's broad networks of avenues and thoroughfares. Elegant highly detailed engraving reveals important buildings, parks, streets, and fortifications. Surrounded by a keyboard style border which is broken here and there to show the city's ring forts. Dissected and mounted on linen in 36 panels for easy folding and unfolding. Published by the Ledot Freres from their offices at 168 Rue de Rivoli, Paris. Very good condition. Dissected and mounted on linen. Comes with original linen folio. Vallee, Leon, Catalogue des plans de Paris et des cartes de l'ile de France, Bibliotheque Nacionale, 1941, #1827, (Ge FF 10893).